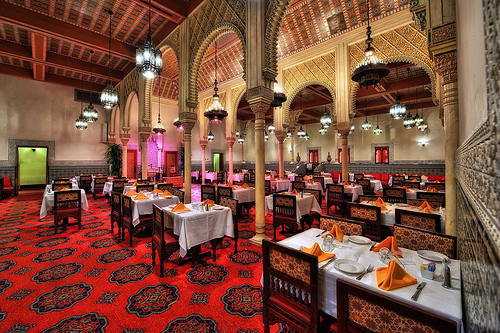 We love Epcot for food and we often find ourselves eating at the quick service restaurant in the the Morocco Pavilion. Since we enjoy Tangierine Cafe so much we figured we should try the sit down option in Morocco which at the time was only Restaurant Marakkesh. The restaurant was absolutely beautiful. While we were there we enjoyed a belly dancer and live musicians. The music was at a reasonable level and we were still able to hold a conversation without feeling like we were yelling. 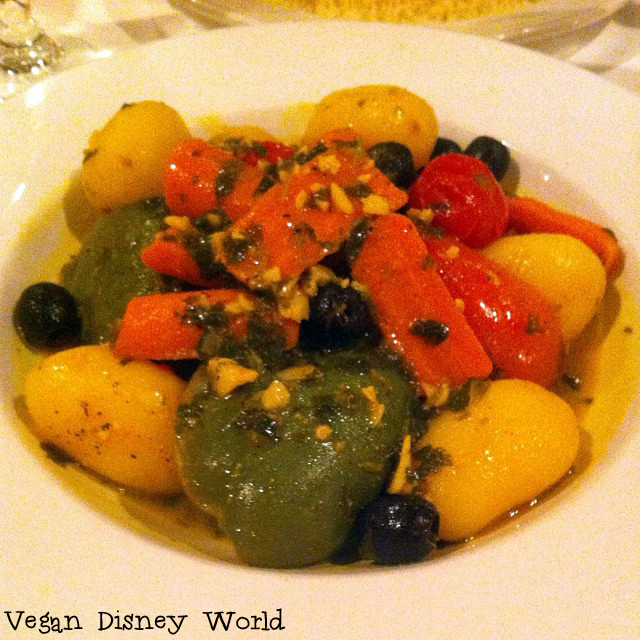 When we were talking to our waiter we informed him that we were vegan and were hoping they could accommodate us. He told us his wife is vegan and eats at Marrakesh all the time. We were then told we would be enjoying what she often eats there and that our meal will be great. He then left with our menus that we barely got to see. It was nice to have him know how to take care of us, however I wish I could have picked something to modify off the menu. Within minutes he reappeared with our appetizer. 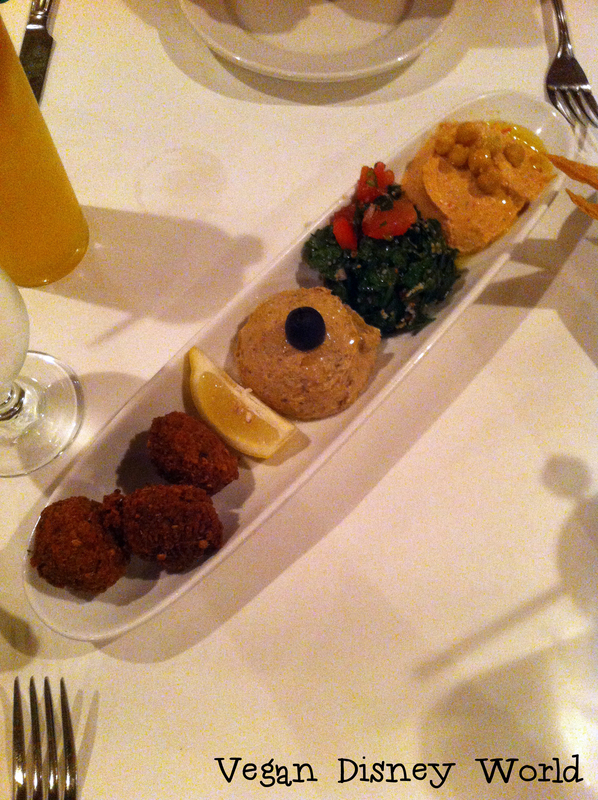 We were given falafel, hummus, tabbouleh and baba ghanoush with crispy pita (not pictured). I could have eaten about five plates of just this. The falafel was packed full of flavor and perfectly crispy on the outside. We both devoured this dish almost immediately. This dish is on the menu listed as Assorted Mediterranean Salads for Two. Mogador Fish Tagine without the fish. Next we receive two dishes from our waiter. One dish was on the menu, but modified, and the other was a couscous dish. 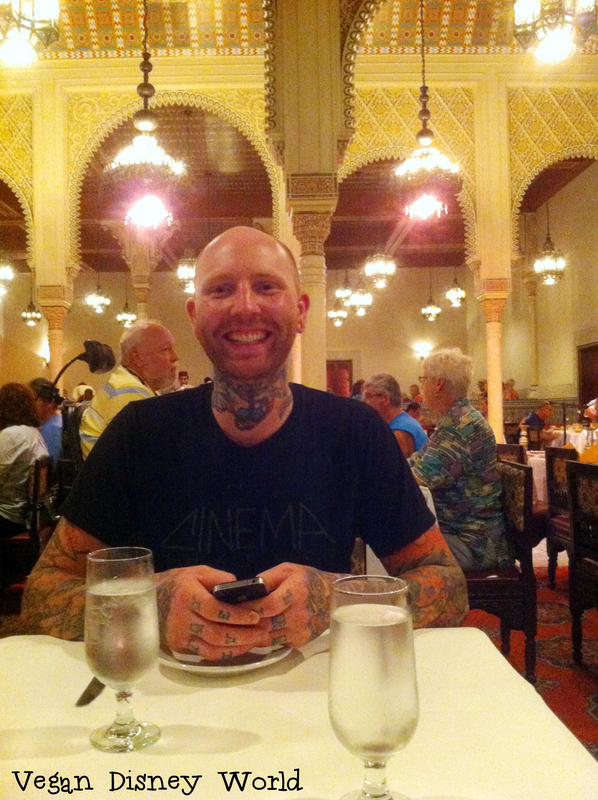 Corey ate the Mogador Fish Tagine which was made vegan by not adding fish. It was full of potatoes, olives, peppers and a chermula sauce. He really enjoyed this and said he would eat it again. 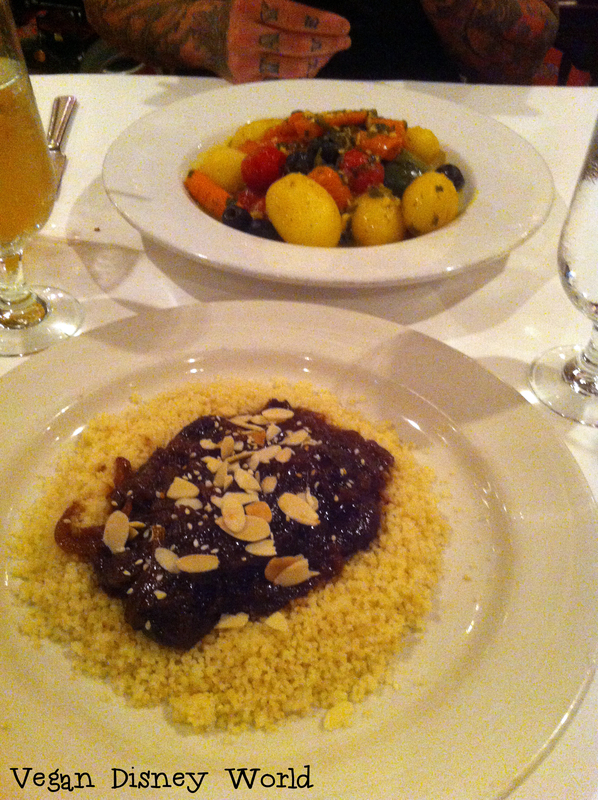 My dish was a couscous dish with some sort of sweet sauce on it. It reminded me of a meal my mother used to prepare as a kid, and not in a good way. It was extremely sweet and was more of a jelly then a sauce. I would have much rather had a vegetable couscous or the meal that Corey had been given. Last we got a dessert, after we said we were too full for one. Our waiter showed up with a plate full of orange slices covered in cinnamon. We both weren’t very impressed by it, but we also weren’t expecting a dessert. Yes- However I would request a vegetable couscous entree and probably get two orders of the appetizer because it was just that good. We really enjoyed the atmosphere and the service was very quick. At what time did you go? Was it full of people or not? What time did they show start? We were there for dinner during the first week of October 2013, it wasn’t super busy that week as it was off season. The belly dancing and live music just happened periodically throughout our dinner. I hope this helps you!